I’ve been working as the administrative assistant at a very small private school that enrolls Kindergarten through eighth grades for a couple of years. Yesterday I presented to the fourth through eighth grade students about this long journey that Tom and I are embarking on in two days’ time. Because it’s a school, of course part of it became a geography lesson, with a map of the U.S., questions about the source, mouth and length of the Mississippi, blah blah blah. The students had some great questions about the hows, wheres and whys and I had a great time talking with them. Today the K-1 teacher brought her students to my office for goodbye hugs. There were very few questions except the one child who asked “don’t you like us anymore?” The teacher was embarrassed, I was amused and quickly reassured the little one that I still loved them all and would be back to tell them of our wonderful adventure in a few months. 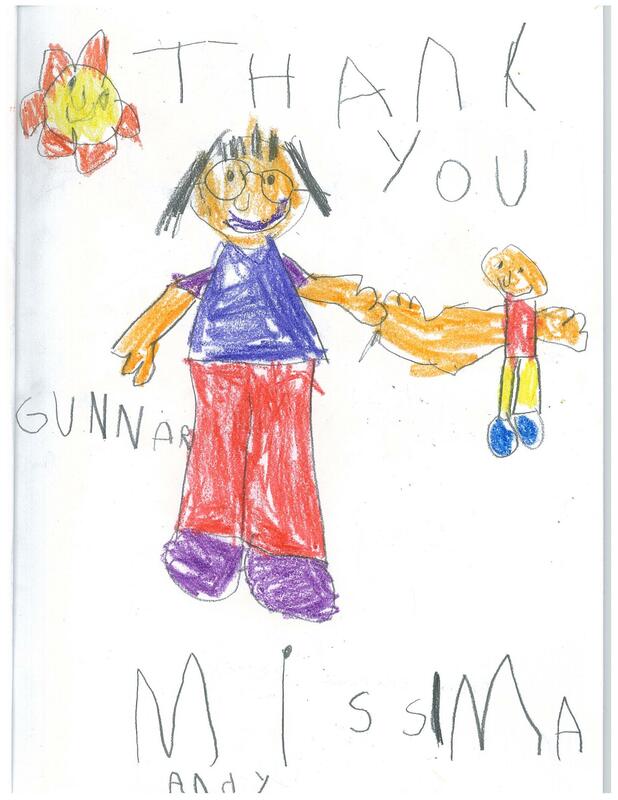 Then they presented me with a commemorative booklet, in which they had each drawn a picture of me and Tom (whom they haven’t met), with some variation of “Thank you Miss Mandy” written on the page. What a hoot! In looking at the illustrations I had to laugh at the varying ideas of what should be included in a drawing of a human being. Sure, part of this contrast is simply fine motor skill level in children so young. But another part of it is the level of observational sophistication, how aware of external detail the child is. 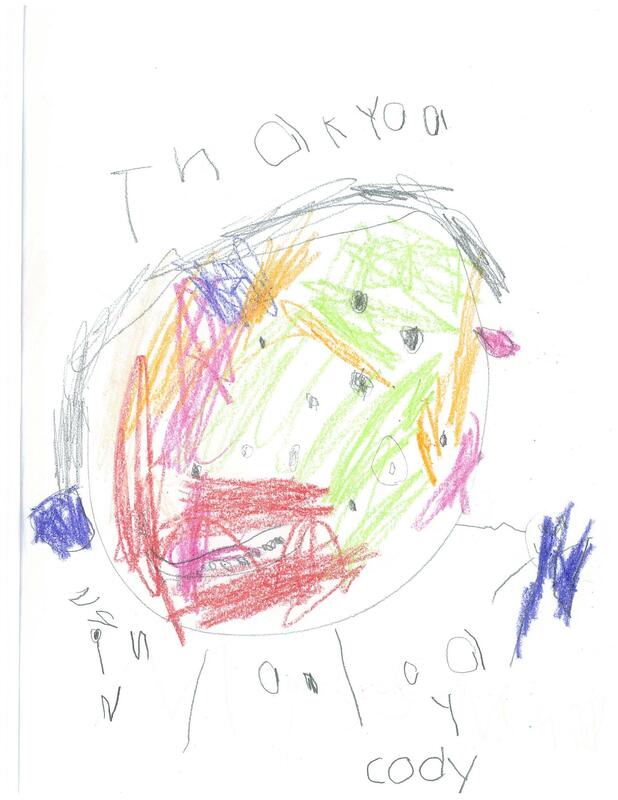 Both of these drawings were done by kindergartener, but what a difference in style. In the drawing below I was especially impressed with the glasses, as I only wear them for reading and looking at the computer here at school! It’s clear he’s never met Tom! I will miss these kids, and the staff and the parents, all of whom have become my friends these past two years. But we are very excited to be on our way. Lake Itasca, here we come! Friend and bike partner Sharry suggested that I post a few times about the more technical aspects of our journey down the Mississippi on our bikes. Good idea, and possibly interesting to even those friends who are not cyclists. Another friend’s son asked if we were taking a “stroller” along behind us to carry our gear. He was apparently concerned that we did not have everything we needed to accomplish this trek. To be precise, it’s not a stroller, but a trailer. And no, we are not using that particular piece of gear. Both of us have a front and rear rack on our bikes, and will each carry four panniers, or saddle bag type packs. But I get ahead of myself. Testing the loaded bike. Picture by Robert Deberry, The Frontiersman. Then, he looked into buying a used touring bike, already set up, like a Surly, Salsa or the like. Not easily found in Alaska for any price, and not much more common in Minneapolis. At least if he bought it there he would save the airfare for the bike. Tom had pondered the merits of using our Bike Friday “Q” tandem, which will configure into a single bike, and pulling the trailer that is also the suitcase it packs into. He’d already ridden Portland to Eugene on that setup a couple of years ago. We have everything needed to make that work. But it’s heavy, and nothing on it is standard. Most bike mechanics look at that and scratch their heads. Finally, after a lot of thought, some research and a long conversation with Ralf at WeBike in Talkeetna, Tom decided to use his newish Specialized 29 inch mountain bike on this trip. Ralf was really interested, and SO enthusiastic about our trip, convinced that Tom did not need to buy a different bike. We suffered a blizzard of suggestions. Replace the suspension fork with a rigid one–it would only be about $100 and would have rack mounts. Go with the existing suspension fork but lock out the shocks so it would be more efficient. Add a front rack made by Old Man Mountain of Santa Barbara which wouldn’t need a mounting point on the fork itself, but connects at the front axle and steering tube. Use his old mountain bike because it already had a rigid fork with braze-ons. 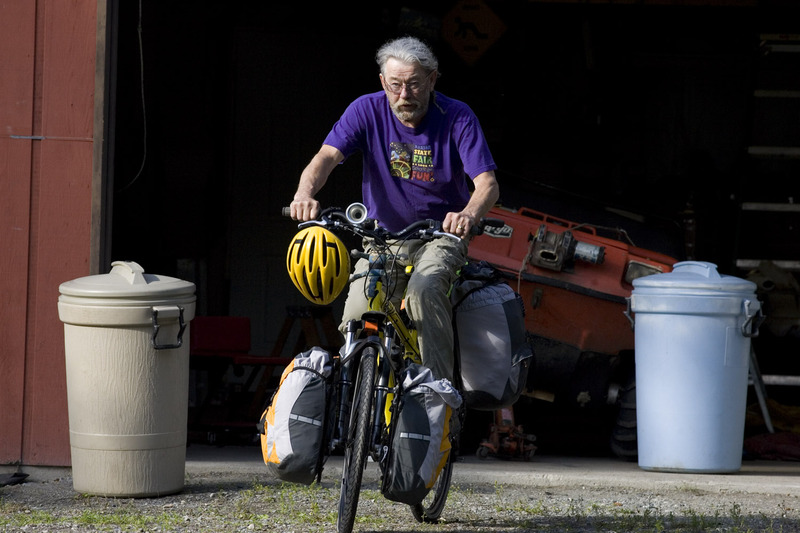 Ralf had any number of specialized gear carrying accessories, from an oversized water bottle carrier for a 1 liter bottle to special axle mounted cylinders for carrying a tent and poles to very light “bikepacking” seat and frame bags. Weighing his options--all 79 pounds of them! Photo by Robert Deberry, The Frontiersman. 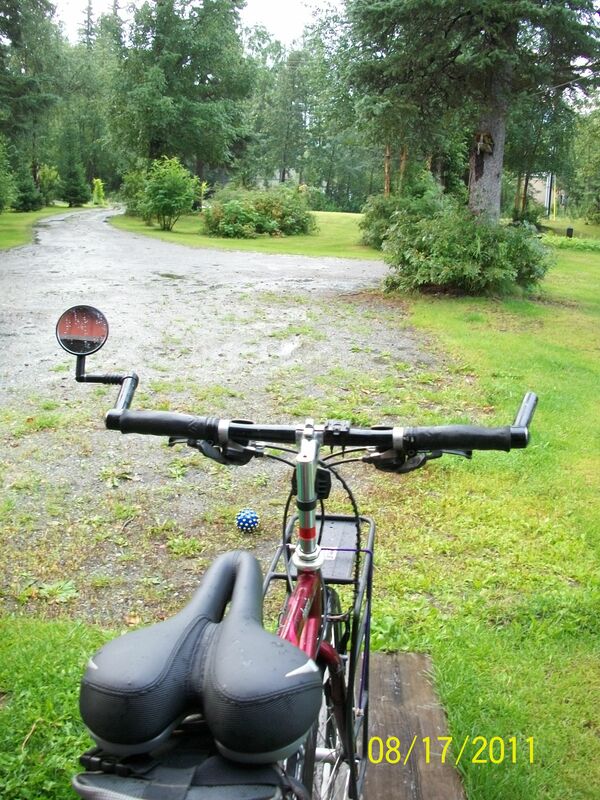 Home again from Talkeetna, Tom weighed the Specialized. Weighed his wallet. Weighed the price of the Old Man Mountain front rack. Voila–one rack, two smooth tires and a set of fenders later he is ready to roll with the river. 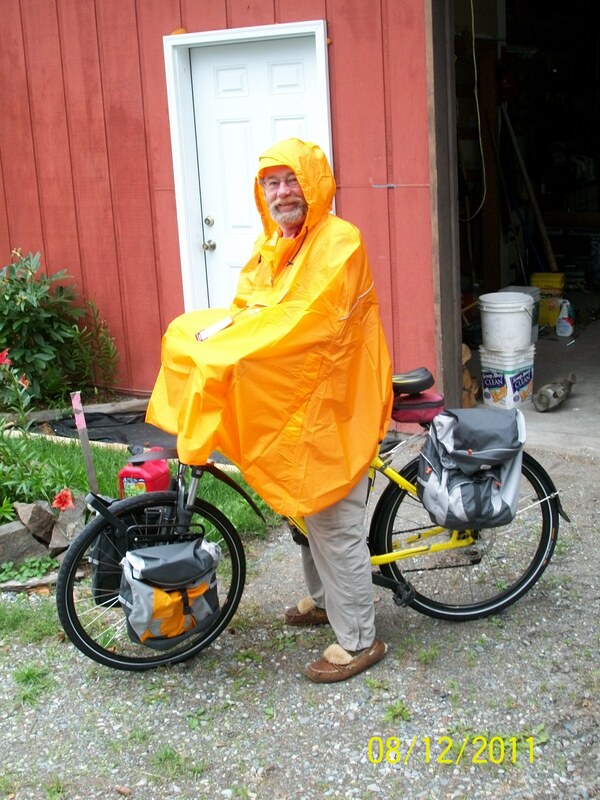 Of course, his new front panniers, ordered after his Great Pumpkin rain poncho, HAD to match. He’s colorful, both literally and figuratively. No one will ever have a valid excuse for running over him! When I told my mom that I was planning to ride the entire length of the Mississippi River on my bike, there was dead silence for a second or so, and then “You’re crazy! It’s dangerous!” Of course, she is 83 and is losing her vision bit by bit. She had far more vision when she was my age. Of course, I am 60 and so it’s no wonder she thinks I’m nuts for doing this. What woman in her right mind plans a 2400 mile bicycle journey, camping and counting on the innate goodness of strangers, to begin her seventh decade of life? “You should take a gun!” Right mom; to slaughter those pesky raccoons, or blow my foot off fumbling around in the dark tent. “No mom, I’ll take Tom instead. He rarely goes off half-cocked and is a lot more comfortable to sleep with“. Of course, Tom swears I’m trying to kill him, but I keep telling him he’s worth far more to me alive. He’s starting to get comfortable with the idea, trundling about the neighborhood and into Palmer, panniers and rack loaded with tent, sleeping bag, cooking gear. I insisted that we take single bikes, rather than the wonderful tandem we own. After 38 years, a backpacking trip to Europe, innumerable hunting and camping trips, I know just how the man packs. “I’m not quite ready; the garage isn’t empty yet!” I want to haul only my own minimal gear. However, I will be entirely grateful for the (insert any heavy, unlikely item you can think of here) when he pulls it out of his bags. Tom Hale, my very own Boy Scout. I’m glad he’s sharing my vision. It could be lonely on the road alone. I really could end up needing that heavy, unlikely item. He can see much better in the dark than I. He is usually willing to give me his warmer sleeping bag on cold nights. He’s afraid I’ll outpace him. 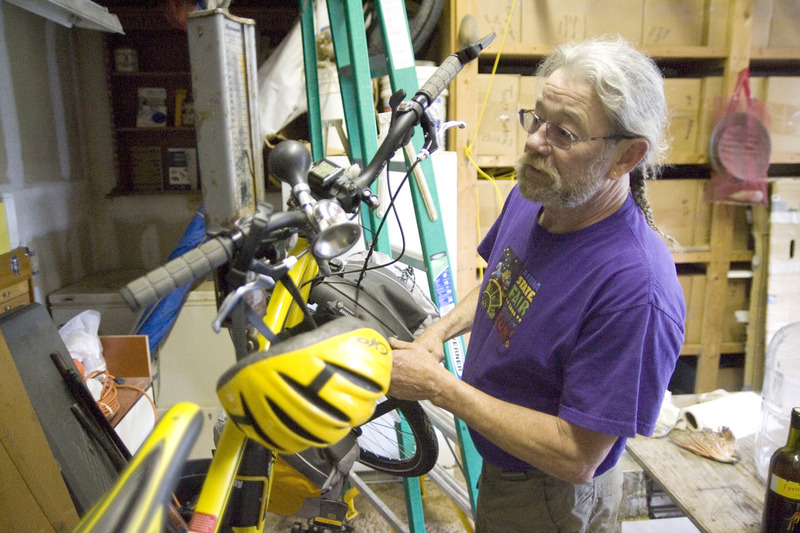 This man did not take to bicycling until he was 55, and then not willingly, but only in self-defense. I’ve told him that I will carry all the communal camping gear for the first two weeks, while he gets his road legs. Then all bets are off—he carries his share, plus whatever optional luxuries he’s brought along. (Camp chair, sleeping cot, microwave…) For a guy who never had a bike as a child he is really being a good sport. So, off we fly on September 1, to Lake Itasca in Minnesota, where we will take photos of ourselves straddling the Mini Mississippi. It doesn’t take many miles for that stream to resemble Paul Bunyan more than Tom Thumb. While the commercially navigable river begins just north of Minneapolis, there are 13 upstream dams on the Old Man, providing flood control, electrical generation and recreation opportunities. The bustling, roisterous river arises at 1475 feet above sea level, and loses nearly half of that before it arrives in Minneapolis, much tamed. From that point south Old Man River is a working stiff. Tote that barge, lift that bale, he just keeps rollin’ along. As will we. A long, long time ago in a galaxy far, far away there was a little house of bachelors in the spruce woods on the outskirts of Anchorage, Alaska. Those boys, all transplants from elsewhere, were having a great time living in the Last Frontier. They hunted. They fished. They drank. And drank. Far into the night and early morning they drank. Sometimes, in the wee hours of the bleary, bright 4 a.m. light of the Alaska summer, one of those bachelors would have an epiphany. And then the chorus. “LET”S LEAVE TONIGHT!” And off they went. A journey of roughly 2400 miles, traveling by bicycle along the Mississippi River and mostly camping does not really lend itself to the literal application of the Let’s Leave Tonight philosophy. Age, material goods, jobs all slow the spontenaity more than a little. Experience points to the wisdom of a modicum of planning. But that spark of epiphany is still there.